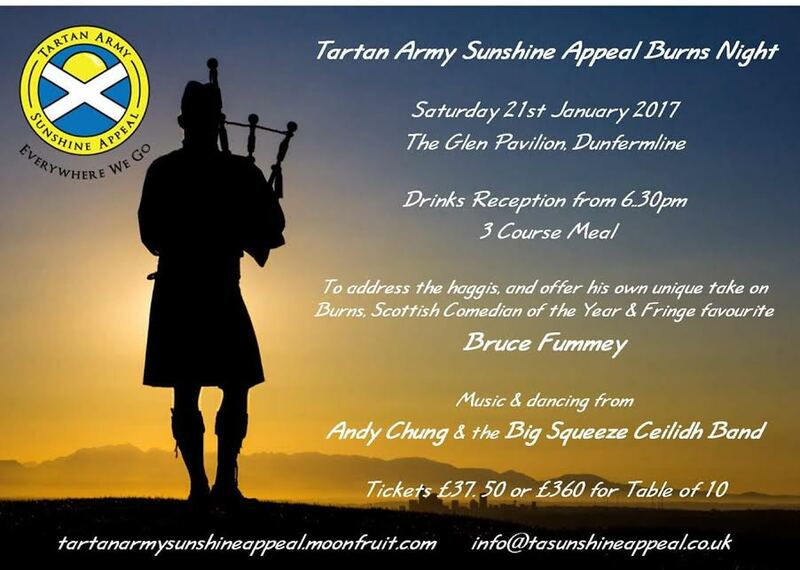 * price includes PayPal fees but if you wish the Sunshine Appeal to receive all your ticket money, please contact one of the Steering group or email us at info@tasunshine.co.uk and we can arrange for you to provide you with the details needed to send your payment as a bank transfer. Grab your glad rags and dance the night away!! 3 Course Set Menu, which of course includes haggis (vegetarian option is available), with a glass of Sparkly on Arrival. After Dinner entertainment will be in the form of Andy Chung, alongside the excellent Big Squeeze Ceilidh Band. Anyone requiring a vegetarian alternative, can you please advise us as soon as you’ve bought the ticket and/or no later than the 6 th of January 2017. We have negotiated a special rate with a local hotel – for further details, please contact us at info@tasunshine.co.uk, including the name of the PayPal account used to purchase your tickets. We’ll send you the details, for you to make your booking directly with the hotel.